This document outlines the process for creating a new record within the CRM. Records can be created in the CRM either under an existing record or as a new standalone record. Before creating any new records in the CRM, it is important that you have correctly searched for any existing ones to ensure that duplicates are not created. It is recommended that you search for both the name of the record you are going to be creating, as well as the phone number and post code, if known. This reduces the possibility of not finding a particular record because it has been misspelt. While all information which is put in the CRM can be altered and amended after it’s been created, it is important to try and enter it in correctly first time and to also use company wide naming conventions. For example, using Ltd instead of Limited etc. It is possible within the CRM to use template documents when communicating with customers. These templates take information from within the CRM and automatically populate the chosen document. If there are any errors, spelling or grammatical, in the CRM these will be pulled through to the document, so make sure everything is correct when you are creating the record. Creating a New Business Contact will allow you to create three levels of the hierarchy in one new record window. You are able to create a new company, division and contact through choosing this option. This is done by using the + icon located next to the search box in the top right of the CRM. Once selected, you will be given the drop-down of all the records which are available to be created. For this example, we will be creating a new Business Contact. The above new record window will automatically open and you can then enter the ‘Name’ of the Company and select the Company ‘Type’ from a drop-down menu. These drop-down options can be created and amended within the Admin Tables. You are also able to assign the company account manager using the drop-down list automatically populated from your user list managed in the admin portal. Once you have entered the company information, the division name will automatically populate to be the same as the company name. You are able to overwrite this if necessary, or leave as is. The operating company will automatically pull through from the accounting system associated with the CRM. If you have multiple operating companies, you are able to select the relevant one from the drop-down provided. If the customer has a website, then you can enter it here in the format www.YourWebsiteHere.com. This will allow you to click through to the record's website easily. This is the main switchboard number for the division record. Once the Division information has been entered, the final stage of the new record creation is creating a new contact. Here you can enter the basic contact information such as title, forename and surname. Once these have been entered, the salutation field will automatically populate with both the title and the surname, but this can be overwritten if required. The salutation is particularly useful for the creation of standard documents from the CRM, allowing you to populate your documents with the contact information. If you know your contact prefers to be known by a different name (i.e. Jon instead of Jonathan) you can enter this here. Here you can select the contact job role from a drop-down list populated in the CRM. This list can be changed to suit your own requirements using the configure list. There you can enter the ‘Job Title’ of the Contact, usually what appears on someone’s business card or email signature. Once you have created the new record, it will contain the information you entered previously and will also allow you to enter additional information as required. A brief outline of the Company can be entered here. This is useful to let other users of the CRM know what the Company does or if any special requirements need to be adhered to when dealing with them. A list of CRM users who can be assigned to the Company as an Account Manager will be shown here. This can then be used for searching, filtering and reporting purposes. Users of the CRM can be set as an Account Manager from within the Admin Tables. This can be used to add an additional, searchable, reference for the Company. This could be a phrase or name which the Company is more commonly known as, but which is not the actual title of the Company. This field can be used to enter where the Company in question originally came from (the source) i.e. a marketing campaign, from visiting your website, sales person referral etc. Once you have created your Company, or are viewing an existing Company, you can then create a Division under it. Remember the hierarchy of the CRM is Company > Division > Contact, so a new Division is created when you are on a Company record and a new Contact will be created when you are on a Division record. To create a new Division, click on the + icon which will then show you a list of records which can be created under the record you are currently on. In the screenshot shown below we are on a Company record and therefore can only create a new Division. 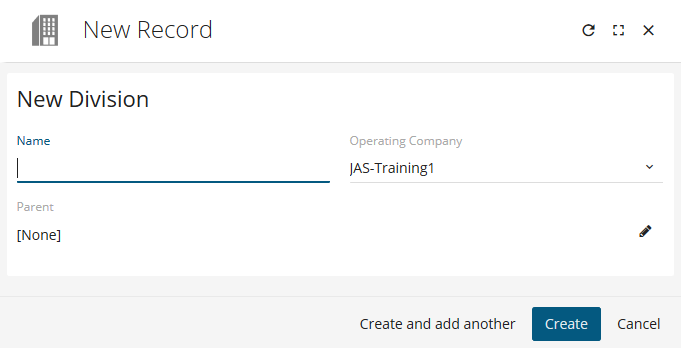 The below new record window will automatically open and you can then enter the ‘Name’ of the Division, which will also display the current Operating Company associated with the record. The CRM can support multiple Operating Companies which are set up within the accounting systems. Once set up they can be selected from this drop down. You can also have different Operating Companies set up which use different accounting systems. It will also show the parent record – for a new Division this is the Company, for a Contact it would be a Division. Once you are happy with the options you have selected just press Create at the bottom and you will be taken to your new Division record. The new record will contain the information you entered previously and will also allow you to enter additional information as required. A brief outline of the Division can be entered here, which is useful to let other users of the CRM know what the Division does or if any special requirements need to be adhered to when dealing with them. This is a set of codes which can be used to classify the type of Division you have created. The types available from the drop-down can be altered and created from within the Admin Tables. Once set these can be used for searching and reporting purposes. A priority can be set for the Division to help with managing tasks or jobs associated with them. Different types of priority can be set within the Admin Tables. By default, the options available are ‘Public’ and ‘Private’. Additional options can be created within the Admin Tables. These are free format text boxes where you can enter the number of employees working at that division and also the type of relationship which you have with the selected Division. Here, you are able to set the ‘Sales’ or ‘Purchase Ledger’. Once the ledger has been created in the accounting system it will then appear in the search results. You are also able to set the ‘Currency’ and ‘Turnover’ if required. As mentioned previously, the Operating Company will be displayed here but can also be altered if required. On the left of the Division record there are tabs which relate to further information about that record. If you select the Address tab you will be able to enter the location of the Division. This will then be used as the default address for any Contacts which are created under it. All the information entered here will be instantly available to all users of the CRM and can be altered and changed at any time. 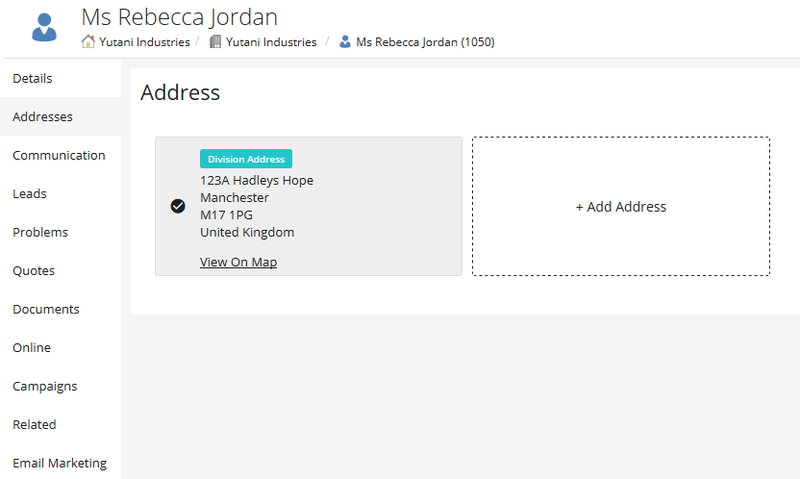 When using the ‘Search for address’ option you can enter a post code or street name and it will check and display any available address details which will be automatically populated in the CRM. Once you have created your Division, or are viewing an existing Division, you can then create a Contact under it. Remember the hierarchy of the CRM is Company > Division > Contact, so a new Contact is created when you are on a Division record. To create a new Contact, click on the + icon which will then show you a list of records which can be created under the record you are currently on. In the screenshot shown below we are on a Division record and can create a new Contact, Lead, Problem or Quote. The new record window, shown below, will automatically open and you can then enter the name of the Contact, a preferred name as well as their phone number and email address. You are also able to select a Role from a drop-down menu, these options can be edited from within the Admin Tables. Once set these can be used for searching, reporting purposes and also when selecting Contacts for Marketing Campaigns and Activities. Once you are happy with the options you have selected just press Create at the bottom and you will be taken to your new Contact record. This section can be used to detail where within the Division the Contact works. This can be used to add an additional, searchable, reference for the Contact. This could be a phrase or name which the Contact is more commonly known as, but which is not the actual name of the Contact. On the left of the Contact record there are tabs which relate to further information about that record. 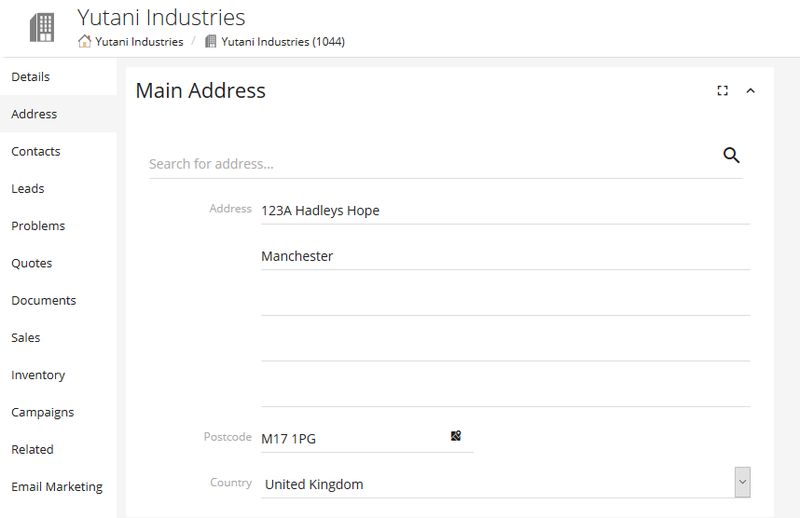 If you select the Address tab you will be able to view the current address for the Contact which is based on the address entered for the Division. If you require the Contact to have a different address set up this can be done by selecting the ‘Create Contact Address’ button. This section allows you to set a password for a contact if they were going to access a website which was hosted by ProspectSoft. The username for the login would always be taken as the main email address held against the Contact. For more information about creating a new Record please see our video below.